Thanks to Dennis Alstrand for his helpful discussion and feedback for this article. Two years ago I restrung my bass-guitar as should be for left-handed players. I am right-handed. But now I play with the E-string towards my feet and my G-string towards my head. I was inspired by one of my favourite mavericks, Jimi Goodwin, then lead-singer and bass-guitarist of the Doves, now a solo-artist who still plays the backwards bass guitar. Jimi is a left-handed bassist playing a right-hand strung bass-guitar. View a stillframe at second 28 of the following film. While left-handed musicians are motivated to play reverse-strung instruments in order to be able to share guitars and use more mainstream instruments, I have discovered some advantages of playing upside down. The lowest frequencies which carry the furthest are muted when higher notes on the thinner strings are played, because the patches on my fingers below the fingertips on my left hand mute the unplayed, lower-pitched strings. 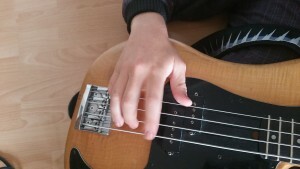 Playing bass with fingertips rather than pick is encouraged because with the reverse string arrangement I do not need to hoist up the wrist of my right hand like a post-Chernobyl waterfowl, or as some refer to him, Geddie Lee. Because I am now playing with fingers rather than picks – why use only one pick when you are born with 4-5? – the right hand also serves to mute unplayed strings, because the right hand often covers all strings. 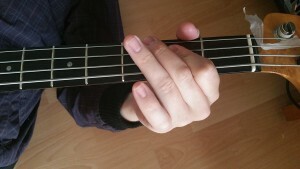 In fact, the left and right hands on a reverse stringed bass-guitar permit no string to inadvertently freely resonate. I play bass in order to control the lowest frequencies, and having these located nearest to my feet feels more intuitive. The room is quite crowded with conventional players. Reversing the strings makes the bass into a new instrument. Yes, it required relearning my instrument, but that also opens up pathways to new songs and newer songwriting. It means that my right-handed guitarist friends do not even try to play on my bass. This playing choice is enhanced by a few additional hacks. One such hack is that I always play using drop tuning, specifically, I detune the E to a D. This locates the octave of the note played on the lowest string on the same fret on the third string. Basically this is a reduction in finger acrobatics necessary to play conventional riffs in covers. 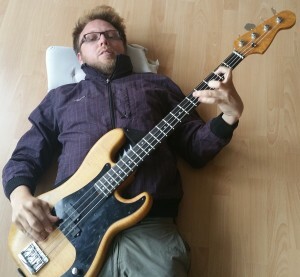 One last recommendation which I have for today is to practice playing your guitar supine. This means laying on your back and playing the bass resting on your torso. This practice technique requires you to play without looking at the fretboard, which is a must if you later want to direct your vocal instrument into a microphone. Secondly, because you cannot rely on sight to control your bass, you learn to play more often using the higher-pitched strings. Your bass has at least 4 strings, so all of them should be used. In my view of music, music is heard, played, sung, but never necessarily seen nor written. Practicing supine reinforces this notion. hello there and thank you for your information – I’ve definitely picked up something new from right here. I did however expertise a few technical points using this site, as I experienced to reload the website many times previous to I could get it to load properly. I had been wondering if your web hosting is OK? Not that I’m complaining, but slow loading instances times will often affect your placement in google and can damage your high quality score if advertising and marketing with Adwords. Well I am adding this RSS to my e-mail and could look out for a lot more of your respective fascinating content. Ensure that you update this again very soon..
Will, I know this is an old post but it was exactly what I was looking for. I’ve played all sorts of instruments but the one I’ve wanted to play most has always been the most difficult for me. I recently purchased a bass to try again and realized that it would seem more intuitive if the strings were reversed! Could you tell me of any modifications that would need to be made to accommodate a string reversal?